In a change of strategy focused on direct sales, the designer has chosen Barcelona as headquarters and reference point to start his expansion, and the first store will open the doors by September 2011, where customers will find the clothes of Fall 2011 collection “Garudà” presented in Mercedes Benz Fashion Week New York on February 2011. Nevertheless, New York is still a part of Toni Francesc’s strategy for sales and promotion, and will keep you updated about it. “Seekers” has been presented today, 14th July 11:00am at the historic site of the University of Barcelona. The clothes have been accompanied by U.S. designer shoes Jeffrey Campbell. This collection is inspired by the migratory movements and the need to survive at a wild environment. The quest for freedom and sense of identity are merged with the aesthetics of different cultures. Nomadic people related to earth and wind as basic elements are the basis of this collection: earth being the place to live and seek the path of their journey, and wind in a metaphorical sense of freedom and mobility. 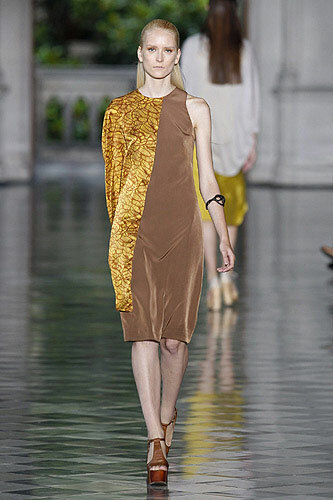 Materials merge to create garments where the fabrics provide a sense of protection and also weathering by erosion. The colors are earthy and yellow like sand and stones, or red and blue as the sky. Silhouettes are broad, overlapping and asymmetrically constructed to imitate shapes of nature to get an effect of protection and feeling good. Seekers is an allegory of humanity, who lives in search of livelihood and the need to be constantly on the move. 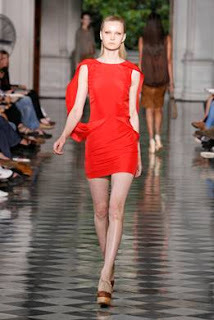 Todas las fotos del desfile y los diseños de Toni Francesc en la pasarela 080 Barcelona Fashion Primavera-Verano 2012. Toni Francesc Spring 2012 "Seekers"